Since 1994 I've been trying to find ways to use maps to show where poverty is most concentrated in Chicago in order to motivate leaders to on-going build strategies that draw volunteer and donors and technology to tutor/mentor programs in high poverty areas. I've not been able to gain much traction on this since I've not found the philanthropic capital needed to build my organization's capacity. Yesterday I came across this article titled "The 10 most segregated urban areas in America". Chicago is 3rd. Milwaukee is 1st. Detroit and St. Louis are also in top 10. Because of the size of these cities, the impact and isolation of segregation is greater, the bureaucracy of schools and cities is larger, thus less able to get everyone working on the same strategies, and the geography is larger, meaning it is more difficult for people from beyond poverty to connect in on-going ways that build relationships, understanding and expand social capital and resources available to high poverty areas. Thus, the problems of big urban areas are different from those of smaller cities and rural communities of America. We use the same words, but our understanding of the meaning of these words, and strategies to help the poor, may be different. To me this means that groups in the top 50 urban areas of the country, perhaps the world, ought to be working together to build poverty maps and program directories, and advertising campaigns to draw volunteers and donors to places in neighborhoods that create bridges connecting the community to outside ideas and resources. Programs like Cabrini Connections do this. I posted a video a few days ago showing how tutor/mentor programs are a format for collective action. They can do this we can inspire leaders to use their own visibility and bully pulpit to build attention and draw daily resources to all of these places. Without the maps this is almost impossible. Below is a new video that I've posted on YouTube. It shows how Cabrini Connections connects many people in a long-term effort intended to help 7th graders joining us in one year be finishing high school six years later and be in jobs and careers eight or more years later. It also shows how the Tutor/Mentor Connection is trying to build leadership support that would help Cabrini Connections and all other tutor/mentor programs in Chicago have the resources needed to do this work more effectively. This video is rough. I'm not a professional. I'll get better as I practice. However, these could be much better if volunteers from a college, high school, advertising agency or some other groups were to adopt T/MC as a partner and create videos like this on an on-going basis as their own leadership effort. 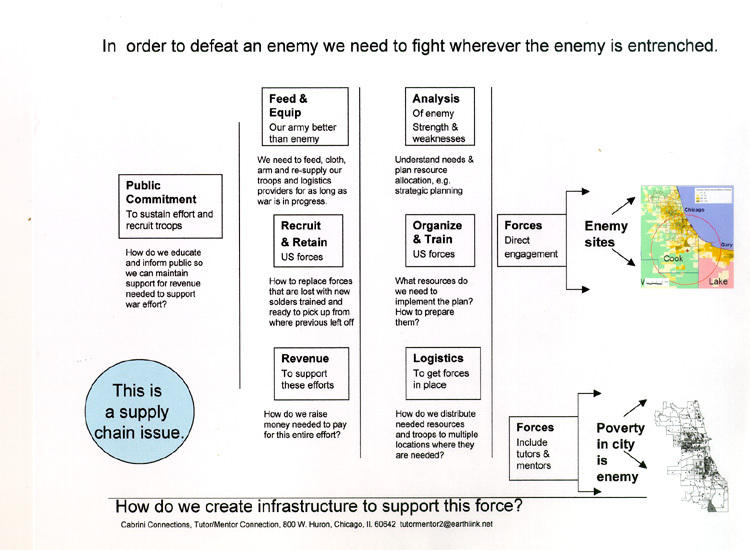 We also could do this better if philanthropic investors/benefactors were to look at these and see how much more impact we might have if they were helping build the organizational capacity of Cabrini Connections, Tutor/Mentor Connection to do this work, and to sustain it for the next 20 years....beyond when I'm still here to be the leader. If you'd like to connect with us call 312-492-9614 or plan to participate in the next Tutor/Mentor Conference, being held on May 19 and 20 at Victory Apostolic Church in Matteson, Il. 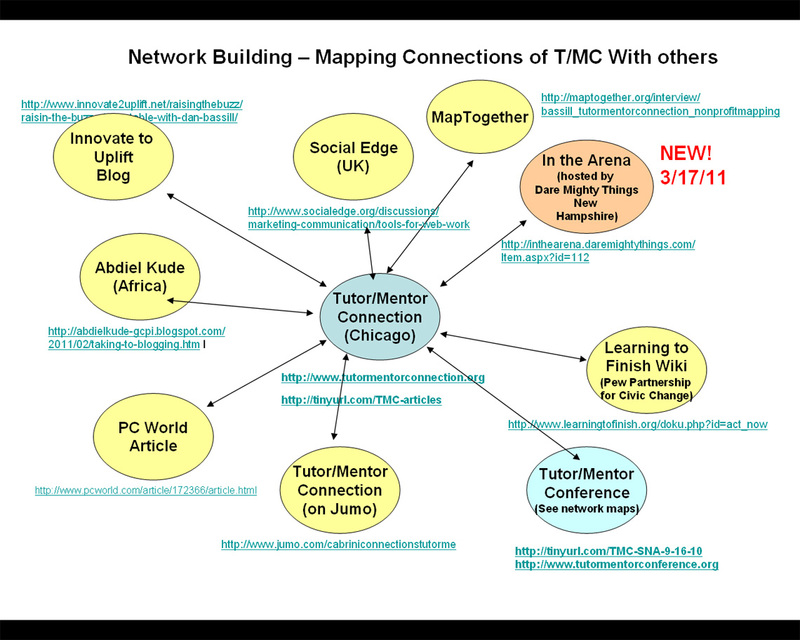 This Blog Article by MapAdvocates focuses on the Tutor/Mentor Connection's use of maps. 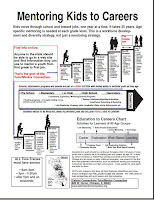 I hope others who value mapping and visualization will step forward and help advocate for the Tutor/Mentor Connection and its mapping strategies so we can build the philanthropic capital needed to continue this project into the future. I encourage you to read this Chicago Tribune article about a creative light show that will highlight the demolition of the last high rise building in Cabrini Green. "On the eve of its demolition next week, the last standing high-rise affiliated with the Cabrini-Green public housing project will be illuminated with 134 LED lights, one in each of its vacant apartments, programmed to blink in "conversation" with one another — with the goal of speaking to the experiences of former residents. Lights will fall as the building does during its month-long razing, scheduled to begin March 30." 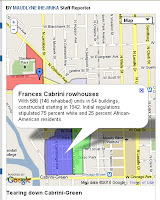 Cabrini Connections students were part of this project (see blog) , and Bradley Troast was quoted in the Tribune article. Does this also signal "Lights out at Cabrini Connections" which has been connecting Cabrini Green teens to tutors/mentors since 1993? It could. Our grant funding has declined over the past few years and we feel some of this is from donors making choices between funding a program serving Cabrini Green, and programs in other neighborhoods with high poverty. If you read letters from our teens, they think we're still needed in their lives. 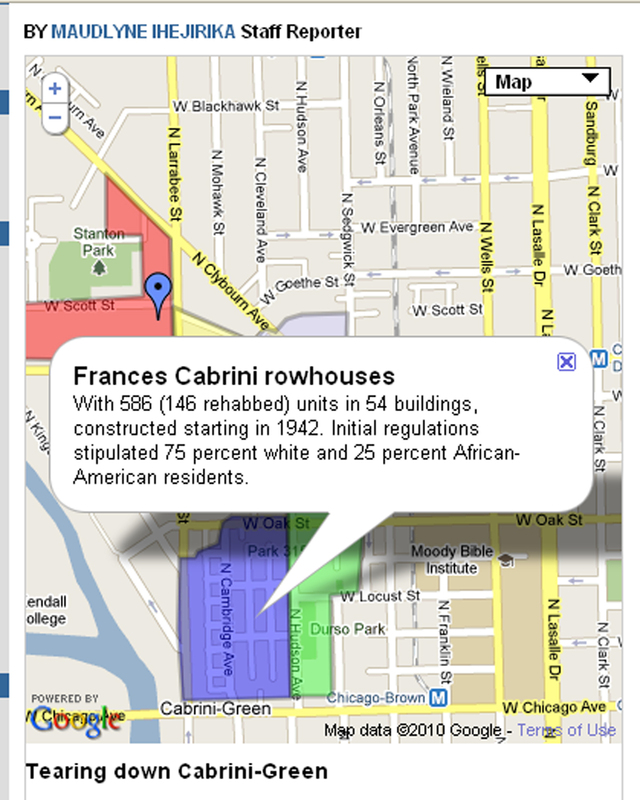 During the coming month as you view the light show, think of ways Cabrini Connections is not only helping teens living in Cabrini Green and in neighborhoods of the web and south side of Chicago as this map shows, but is also using its web site to share information about what we do that others can use to build programs like Cabrini Connections in other places.. 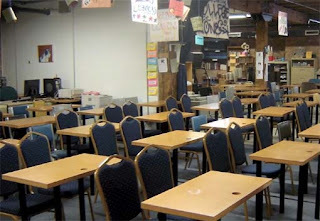 If you have been part of Cabrini Connections in the past, present or want its help in the future, please send donations to help keep our lights on as we move into the 2011-12 school year. Donate here. See more about ways to help. 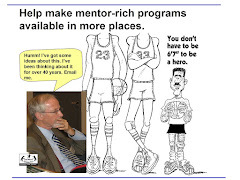 I'm learning to use video to share the ideas I've developed over the past 37 years of leading a tutor/mentor program in Chicago. Below is my latest effort. We're hosting a next Tutor/Mentor Leadership and Networking Conference on May 19 and 20 in Matteson, Il. The conferences offer a place for the people we connect with on line to come together and share ideas face-to-face. 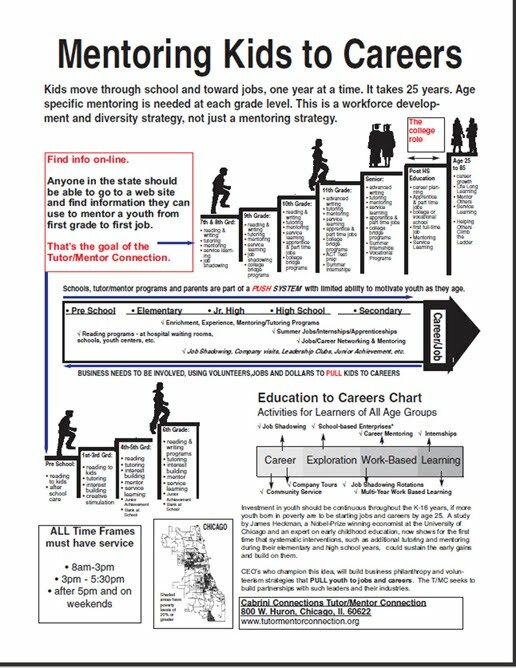 At the same time they focus on the need for high-quality tutor/mentor programs to operate in many places and the need for innovative funding streams to be developed so each program has the consistent flow of flexible resources needed to grow from good to great...and then stay great for many years. If you can attend, fill our the workshop presenter form and submit your workshop or panel idea. 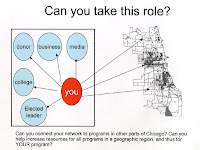 If you want to become a philanthropic investor and help us build the capacity of the Tutor/Mentor Connection, or a donor to support the conferences and other activities, please introduce yourself by calling 312-492-9614 or sending an email to tutormentor2 at earthlink dot net. We've been building the T/MC with bits and pieces of talent and donor support. Without philanthropic investors and new leaders to help, we're just a small voice in the wilderness saying there's a better way. Another War. Another Tsunami. Another Day. We've all heard the story of the "tortoise and the hare". The rabbit gets off to a fast start then runs out of gas. The tortoise just keeps plodding along, passing the rabbit as it keeps on its own journey." 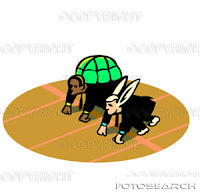 In my efforts to keep Cabrini Connections available to the 7th to 12th grade teens who are part of the current program, as well as those students and volunteers who have been part of Cabrini Connections in past years, I feel like the "tortoise". In my effort to build a Tutor/Mentor Connection information-base and communications strategy that helps tutoring and/or mentoring programs like Cabrini Connections get the resources the need to operate I feel like a very slow, very old tortoise. However, the "hare" in this case is the on-going challenges we and other social-benefit organizations face from events we cannot control. Over the weekend the US and its Allies launched another war. Just over a week ago the forces of nature unleashed one of the worst natural disasters in our history on the people of Japan. Public attention and public and private resources are once again mobilizing to respond to these disasters. Yet, these disasters are just part of a series of wars, earthquakes, tsunami's and hurricanes that have plagued this planet over the past 10 years. In September, 2005 I wrote an article titled "Disaster Challenges us All". What I said then is as true today as it was then. 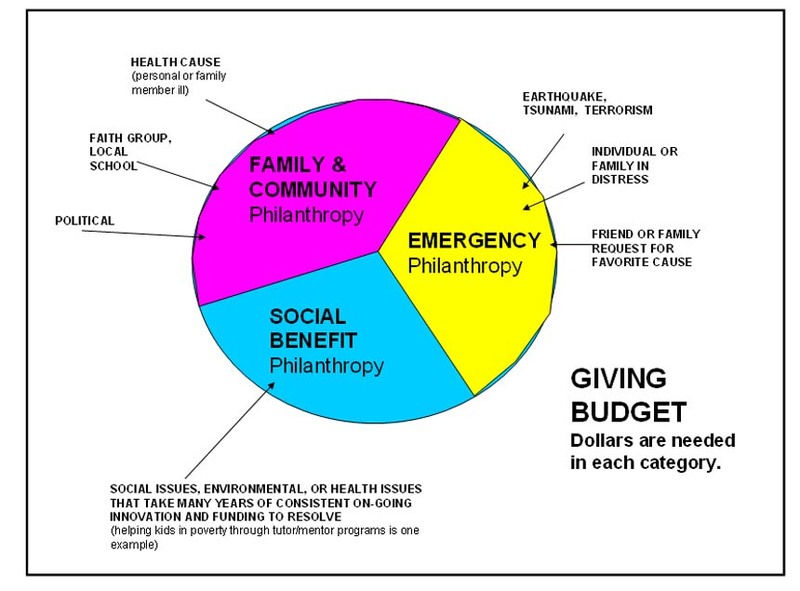 We need to educate the world to create three pools of generosity and compassion, as represented by the chart below. One part of this budget focuses on responses to disasters (the hare in my story). Another part focuses on personal/family disasters, such as a child with cancer. The final third, focuses on the on-going funding needed to solve complex problems. Helping kids born or living in poverty requires consistent, long-term investment. Just like doing cancer or AIDS research requires long term investment. Just like rebuilding Haiti, the Gulf Cost, or Japan will require long-term investment after the initial surge of donations has passed. 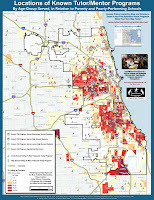 This map of Chicago shows high poverty areas, and locations of organizations that provide tutoring and/or mentoring. All of these organizations need a consistent flow of dollars, volunteers, technology so they can stay connected to the kids they work with. These funds need to be available when we're at War, and when we're responding to natural disasters, or many will not be able to maintain key staff, connections with youth and volunteers, and the long-term race to help poor kids grow up to lead lives out of poverty. I sometimes wonder what motivates the tortoise to stay in this race when there are so many obstacles. I spend time every day searching the network for places where I can share ideas and connect with others who are also working to support the growth of volunteer-based tutor/mentor programs. Each forum connects me with a range of people beyond those who come to our web sites. Each represents potential volunteers and donors who would help us do our work, and whom we can help do their work more effectively. This map shows just a few of the connections I have made. I've highlighted the "In the Arena Forum" who invited me to participate and introduced me with this article. See PDF of this map. At this link you can browse a list of organizations where we connect and share ideas, or who have written articles about Cabrini Connections, Tutor/Mentor Connection, to help us share our ideas. Scroll through the "blog exchange" links on this site and you can see many more examples of such connections. There's a discussion about philanthropy and social change taking place on Social Edge this week. See how I share ideas and connect people from my network by my participation. 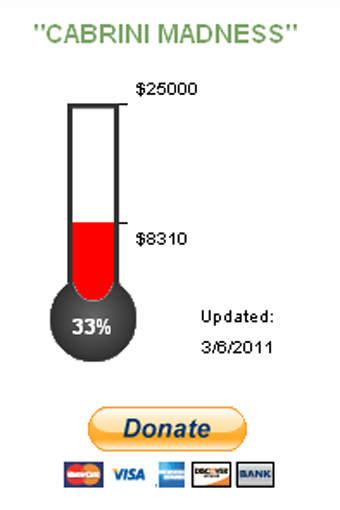 This is intended to earn trust and interest which draws more people to become involved with the T/MC and the work we do. 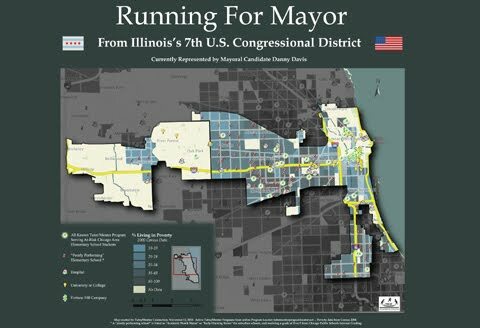 The night after Chicago's February election I woke up with this image stuck in my head. I wrote about it the next day. Thanks to Nicola Avery, a volunteer from the UK, I've learned to use CamStudio to create videos that I can upload to share my ideas. Below is the first of what will become many new videos. 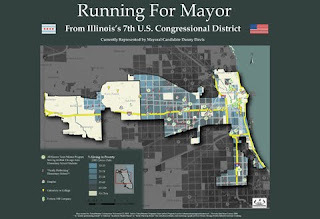 This one shares my dream of what type of leadership I hope the new Mayor will bring to Chicago. Will this happen? Will you share this with the Mayor-elect? Will he use is many resources to help the Tutor/Mentor Connection continue to collect and share information like this? I was interviewed today and one question was "who do I admire most and why". I have studied history since high school and majored in it in college. I spent three years in Army Intelligence, which is where you learn to use best-available information to make decisions that affect thousands of lives. I’ve applied this to my own efforts. Thus, I have many people who I admire, rather than one or two. In the T/MC web library are many organizations that I admire for the work they do. However, if I had to pick one person it would be George C. Marshall who lead the US military in World War II. At this link you can read about how he had to “ fight a global war which had two fronts: one in Europe, the other in the Pacific” . He realized that to win he had to “make sure the military had the materials and manpower they needed. Material had to be manufactured and people had to be trained, which took time. Organization of supply distribution needed to be accurate and efficient". He did all of this without the aid of laptop computers, cell phones and social media. Wow! He must have been one heck of a visual and spatial thinker. I see tutoring/mentoring as a way to engage more people who don’t live in poverty in the war on poverty, which we’re fighting in many places. 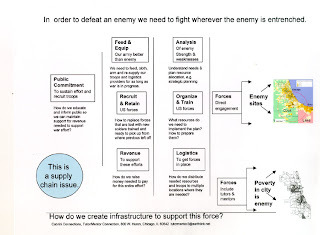 In this blog article I compare this to a military campaign and show that without supporting the “troops in the field” the way Marshall did in WWII, we can’t win. My goal is to recruit others who have greater talent, more civic reach, and greater energy who will collectively take on the role of George C. Marshall in our efforts to win the war on poverty by helping kids who are born or living in poverty have support systems that help them get the education and jobs that enable them to live their adult lives and raise their own children beyond the reaches and influences of high poverty neighborhoods. We need to build an organization to support this effort, and to sustain it in future years when new leaders need to step forward to take the place of myself and others who have started this movement. This article on Tipping Points illustrates some of the things that I think need to happen. Sean Stannard-Stockton, CEO of Tactical Philanthropy Advisors, wrote a series of articles last week under the title of The Effective Philanthropic Investor. I encourage you to read them all, and the comments. I pulled out excerpts from his articles and some of the comments so I could reflect on these in context of what Cabrini Connections, Tutor/Mentor Connection has been trying to do since 1993. This is a rather long article, so I posted it on the Tutor/Mentor Connection forum, which is a workspace for people to help us meet our mission and goals. As I was drafting this I received the spring copy of the Stanford Social Innovation Review. Two articles in this relate to what Sean wrote and what CC,T/MC has struggled with since we launched in 1993. One is titled "Increasing Civic Reach" and the other is titled "Letting go". You need a subscription to SSIR to read the Letting Go article. If Chicago is to have a full range of mentor-rich, non-school learning organizations supporting we need philanthropic investors and leaders with civic reach to help us. Our forums, blogs, conferences, etc. are meeting places where interested stakeholders can help us build this better operating system and make it available to Chicago and every other major city in the world. Have you ever heard the story about the person who got on an airplane to fly from one city to another but the plane only had 90% of the fuel needed to get there? This is how I feel just about every day. While we get donations of time and dollars from many different sources, none fills the tank for the entire year's operations. None provides the fuel it takes for Cabrini Connections to stay connected to a 7th grader for the six years it takes for that youth just to finish high school. I feel like the a child who was given birth and then three years later the parent says, "I can't fund you any more. Find someone else." I wonder how many kids in Chicago neighborhoods feel the same way. I operate in Chicago, one of the wealthiest cities in the world. The Cabrini Connections, Tutor/Mentor Connection office is North of the downtown area, so when I walk to the El and look at the skyline the image below is what I'm seeing. Every building represents a network of people who could be volunteers, leaders, tech support and donors supporting the work Cabrini Connections, Tutor/Mentor Connection does each year to help inner city kids be part of mentor-rich programs like Cabrini Connections. 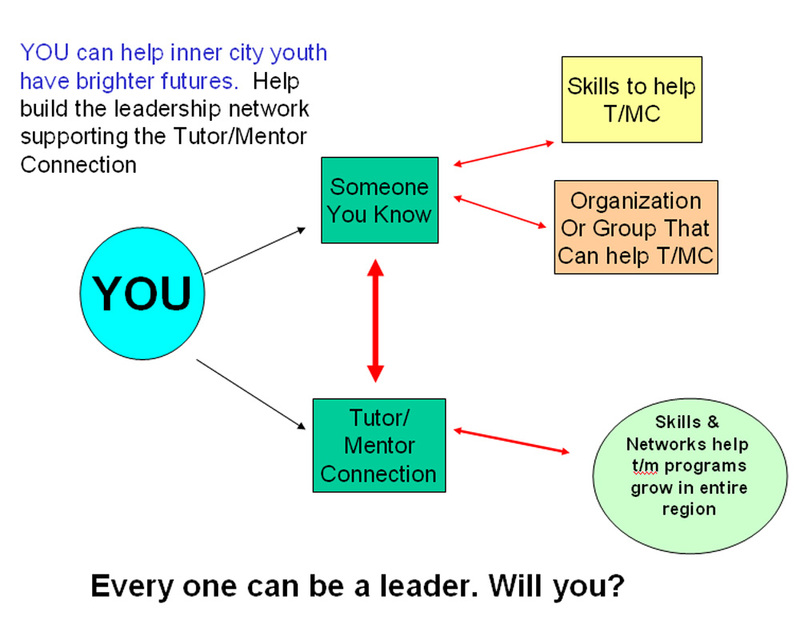 All it takes is for one person to take on the leadership/facilitator role to bring people together so they learn why a tutor/mentor program is important, where they are needed, and what they can do to help them. View some of these animations to see many leaders could be taking this role. Throughout the year people in downtown and suburban office buildings could be organizing events that encourage people to volunteer or donate money, with the goal that a growing percent of the occupants of each building were participating in big or small ways to help Cabrini Connections and similar programs have 100% of the resources needed each year to help the kids they work with. Imagine if the new Mayor were to embrace and encourage this idea or if it were part of the new plan for school reform offered by the leaders of Chicago Public Schools. 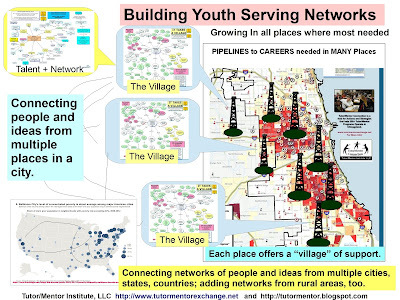 Read past articles to learn more about roles of leaders, universities, faith groups and see how maps can be used to guide a distribution of volunteers and donors into all of the high poverty neighborhoods of the Chicago region where each tutor/mentor program has the same need for 100% annual funding of their operating budget. We'd like to help you organize on-going communications programs in your building, your faith group and/or your business. Email tutormentor2 at earthlink.net or join us on the Tutor/Mentor Connection forum. 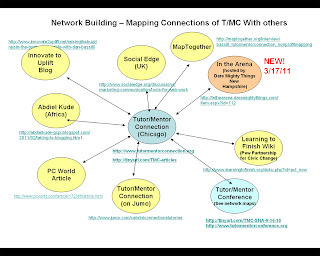 Note: 11/24/2017: Tutor/Mentor Connection (T/MC) and Cabrini Connections split into separate organizations in mid 2011. Dan Bassill, author of this blog, now leads the T/MC through Tutor/Mentor Institute, LLC. The mission and the message have not changed. A DePaul University student wrote a blog article last fall and ended it with "Ask not what Dan Bassill can do for you, but what you can do for Dan Bassill." Over 35 years of leading a tutor/mentor program I've seen my role as being the one who makes it possible for everyone else to gather and do their thing at Cabrini Connections, or at a Tutor/Mentor Leadership and Networking Conference. When I see a group of teens and volunteers in a room, I can say "What I see, is because of me". Without the efforts of myself and a few other leaders, such as Ray Dowdle of our Board of Directors, Cabrini Connections would be an empty space. Tables with no students and volunteers. In fact, there would not even be a space with tables for youth and volunteers to meet on a regular basis, and for guest speakers like GLC to come and provide motivational messages to our teens and volunteers, as he did last night (see video). 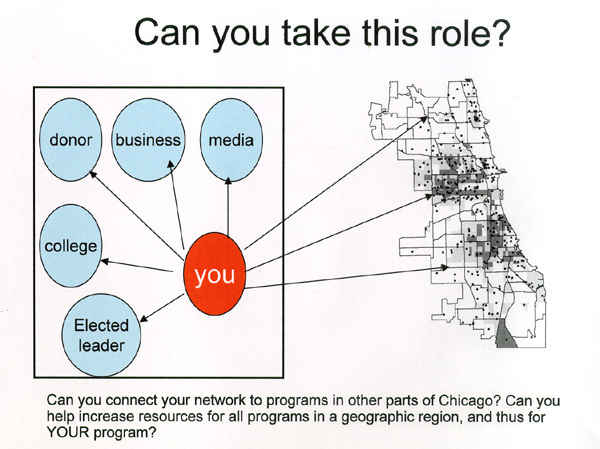 Places are needed in many parts of Chicago and the suburbs where youth, volunteers, motivational speakers, technology and all sorts of extra learning are available. But without a core group of leaders who make the commitment to build and sustain these programs, often at great personal sacrifice, there will continue to be too few places where the tables are full and new connections are being made each week. More than 5,000 students and volunteers have been part of the tutoring/mentoring programs I've led since 1975. I'm connected to many of these alumni on Facebook and Linked In as well as to former executives from the Montgomery Ward Corporation who provided the space and dollars for the program to operate until 1999. While I've written countless letters, articles, email messages asking for help to build and sustain Cabrini Connections, and help similar programs grow all over the Chicago region, this DePaul student has said what I've not been able to communicate effectively in all these years. Ask not what Dan Bassill can do for you, but what you can do to help Dan Bassill continue this effort for another decade or more. 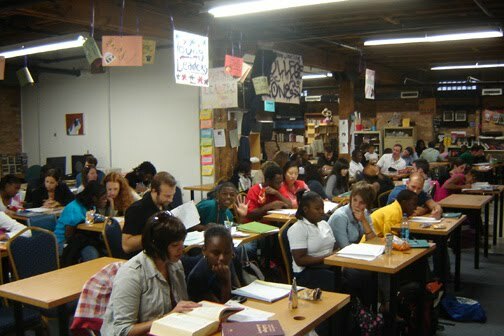 * be a donor - send tax deducatable donations to Cabrini Connections, Tutor/Mentor Connection, 800 W. Huron, Chicago, Il. 60642. Or use this on-line PayPal form. * Be a Network Builder - share the articles I write and information on our web sites with people in your own business, fraternity, faith group, etc. Don't let the empty spaces be the future for tutor/mentor programs like Cabrini Connections.